First impressions can have a lasting effect. That’s why it’s always important to put on a good face when meeting someone for the first time. The same goes for food. I remember the first time my mom fixed scalloped potatoes and ham. Just the smell of it made me gag. Whenever she made it, I never ate it. Even the scalloped potatoes we had for school hot lunch in the basement of the old Cathedral High School in Crookston, Minn., turned me off. As soon as I started walking down the stairs to the lunchroom, the wafting of the scalloped potatoes and ham almost got me sick to my stomach. I never once ate the dish, which really puzzled my Auntie Helen – who was the head cook – since there wasn’t any other food that didn’t appeal to me. We never had lasagna at school nor did my mom ever fix it, and I don’t recall the first time it crossed my palate, but it had a pretty positive effect. I just love lasagna, no matter if it’s vegetarian or loaded with meat. I think the cheese has something to do with it. Cheese is my downfall. If there is some in the refrigerator, cheese doesn’t last very long. Just recently, we purchased a couple of large chunks of cheese. One was Dubliner, the other sharp Cheddar. Both are gone. 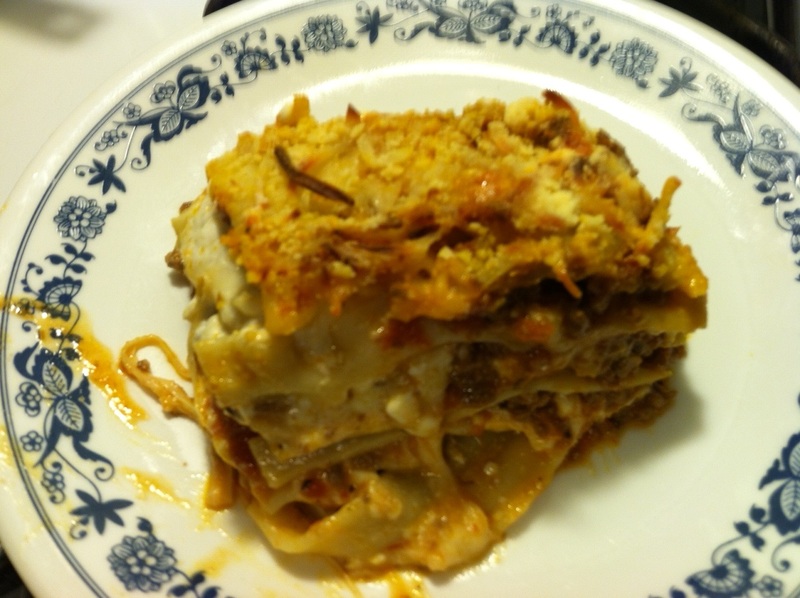 Here are a couple of lasagna recipes that I really like. Both are my own creation. And both are extremely tasty, and everyone will like them. Brown the meat in skillet and set aside. In a large pot, saute onion, garlic and celery in olive oil. Add the tomatoes, sauce, paste and herbs and spices. Bring to a boil, then simmer for about 30 minutes before adding meat, which has been drained. Continue to simmer for about another 20 minutes or so. Using a 9-by-13-inch baking dish (I prefer metal), cover the bottom with sauce and line the dish with a layer of lasagna noodles. Dot with spoonfuls of ricotta, mozzarella, Parmesan and cottage cheese. Cover with sauce. Repeat with another layer of noodles, sauce and cheeses, until baking dish is almost filled. Bake about 45 minutes. Cool 10 to 20 minutes before serving. Saute eggplant in olive oil until lightly brown. Set aside. Combine sauce ingredients and bring to a boil. Simmer for 20 minutes. Line an 8-by-11½-inch baking dish with cooked lasagna noodles. Top with a layer of eggplant, followed by sauce and Swiss cheese. Repeat layers of noodles, eggplant and sauce and top with Parmesan cheese. Bake in 350-degree oven for 35 to 45 minutes. Let cool for 15 minutes then cut and serve. This entry was posted in Uncategorized and tagged chef jeff, chef jeff tiedeman, food, lasagna, recipes, vegetarian lasagna by Jeff Tiedeman. Bookmark the permalink.